More quakes in strange places after the magnitude 4.1 on the Delaware coastline hit the US yesterday. 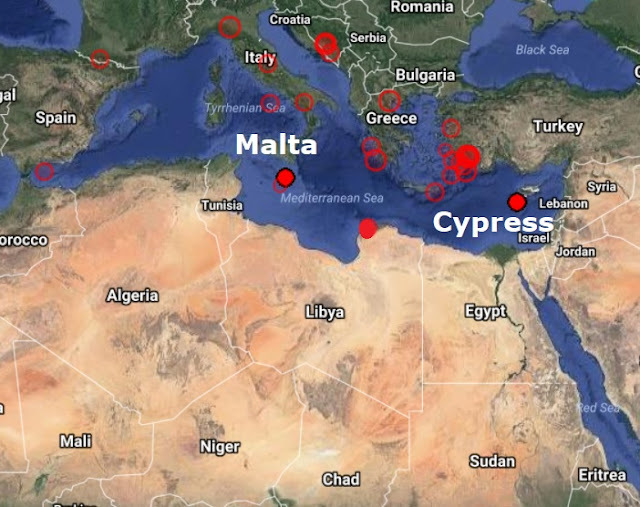 The Mediterranean islands of Cyprus and Malta were hit with a mag 4.4 and a mag 3.2 respectively and a more powerful earthquake shook northern Libya. A tremor was felt in several parts of Malta late on Friday night. Reports indicated the tremor took place at 11.11pm some 30km south of Malta. The Seismic Monitoring and Research Group of the University of Malta said it had recorded a magnitude of 3.2. An hour earlier a small earthquake was felt 41 km northeast of Siracusa in Sicily. Earlier a more powerful earthquake shook northern Libya and a tremor was felt on the island of Cyprus as a magnitude 4.4 struck off the southern coast. 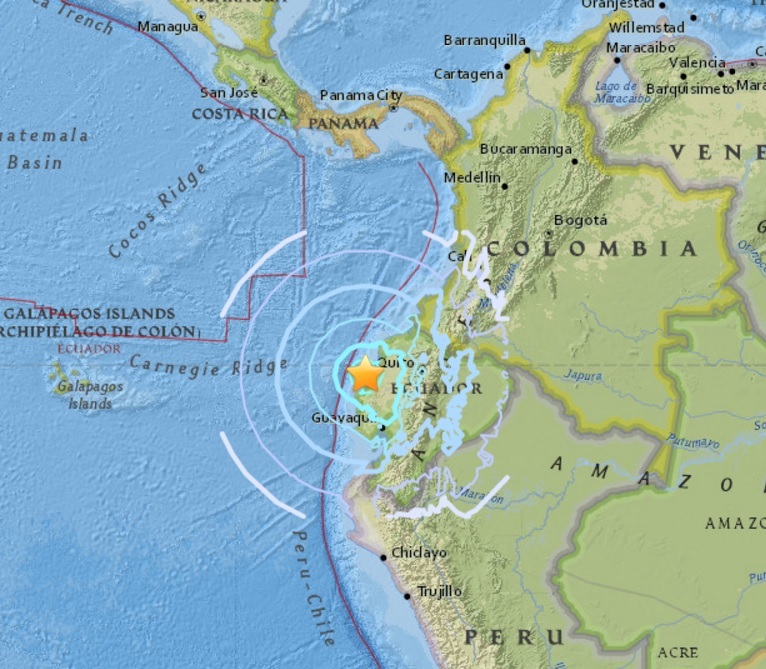 EMSC, an independent earthquake monitoring organization said it was a small earthquake which caused no danger. It does not appear to have been felt in the North of Malta or Gozo but it appears to have been quite strong in Birzebbua. One report said Luqa residents were forced to leave their homes as they felt their buildings shake with the tremor. "I felt the furniture shaking," a resident of Malta reported. A man reported on social media that his house in Vittoriosa shook for some six seconds. September will be remembered for two massive quakes in Mexico, four devasting hurricanes in the Atlantic, two tropical cyclones in the Pacific, deadly flooding in India and Bangladesh, two monster X-class flares and a spike in volcanic activity, September 2017 was probably the most devastating month in modern times with more than 50 million people evacuated around the world. Calm before the storm? 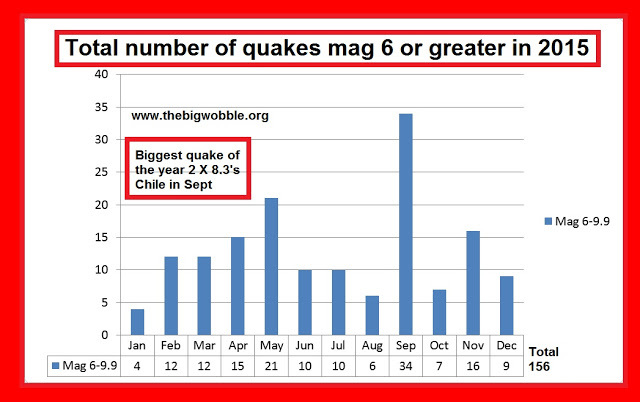 August continues the massive downward trend in quakes of mag 6 or higher: Should the alarm bells be ringing?
. Could the Sun entering it's solar minimum be the reason for the massive drop in major quake and volcano activity this year? 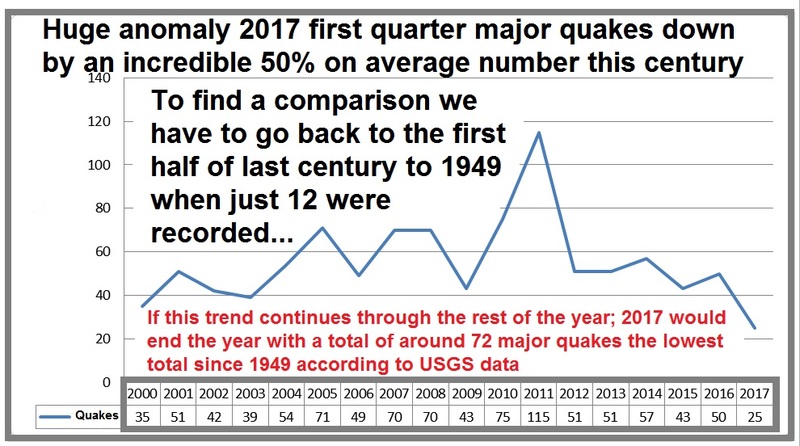 It's the second smallest total in almost 40 years from January to August 2017 has witnessed major quakes dropping off the cliff altogether and we could be heading to the lowest total in decades, which is extremely interesting when you consider major quakes have increased by over 450% since 1900. 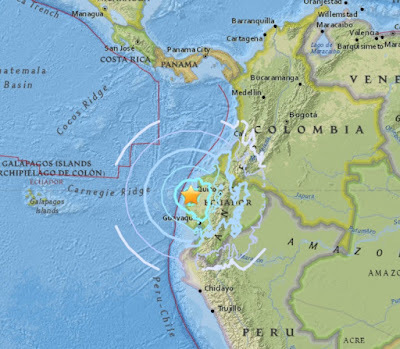 Last nights magnitude 6.0 on the Ecuador coast was the tenth major quake of June and the first time this year a months total has reached double figures in an astonishing quiet period for major quakes, I know I keep banging on about this but the drop off is unprecedented in the last 117 years. It can’t be possible, it’s reminiscent of a stock market crash, it’s unheard of in more than a hundred years, it’s a huge anomaly and it shouldn’t be happening but it is! It will come as a major shock to some people but incredibly major quakes in the first quarter of this year, 2017 is the lowest amount since the first half of last century with just 25 major quakes recorded since January 1st, 2017. Waiting for the big one! 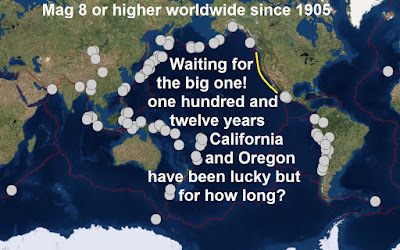 Magnitude 8.0 or greater has somehow missed California in more than 100 years: A question of when not if! 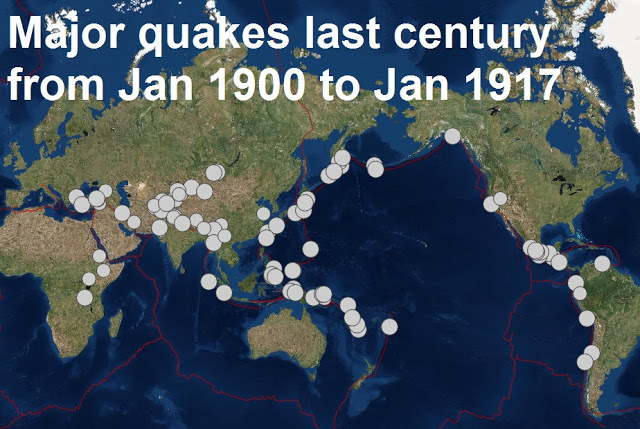 Since 1905, 91 quakes of magnitude 8. Or higher have been recorded around the world and 90% of them have been on the Pacific ring of fire. The Ring of Fire is a major area in the basin of the Pacific Ocean where a large number of earthquakes and volcanic eruptions occur. 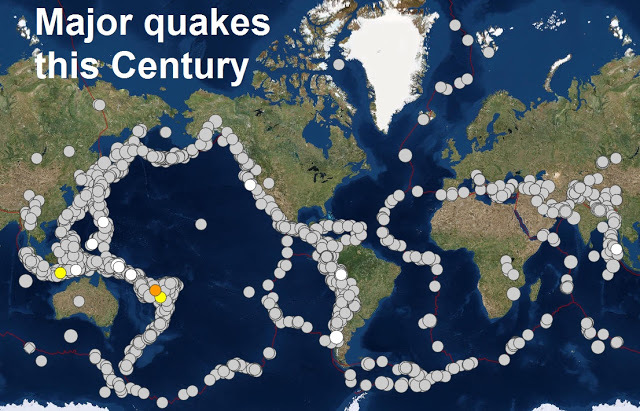 Where have all the major quakes gone? We are into the second half of April yet this year’s total so far is extraordinarily low, 2017 has recorded only 21 quakes of magnitude 6 or higher, this total is the lowest this century by a country mile at this stage of the year. Have the United States Geological Survey altered historic data on their website so as not to panic the people as major quakes have risen by more than 400% since 1900? 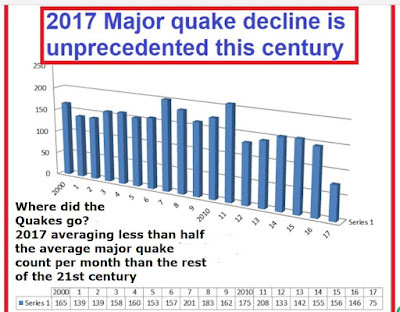 It is a well-known fact that the United States Geological Survey (USGS) has gone on record as saying major quakes are not increasing, they have stated that no such increase has been detected around the world. Because this topic is so often debated USGS issued a press release claiming major quake increases are not occurring. 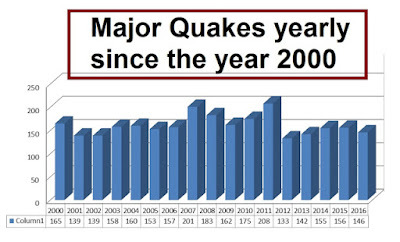 This surprised me, because, in 2014, I downloaded every quake from mag 6; upwards from 1900 to the end of the year of 2013 and placed all the data on a graph, supplied below. 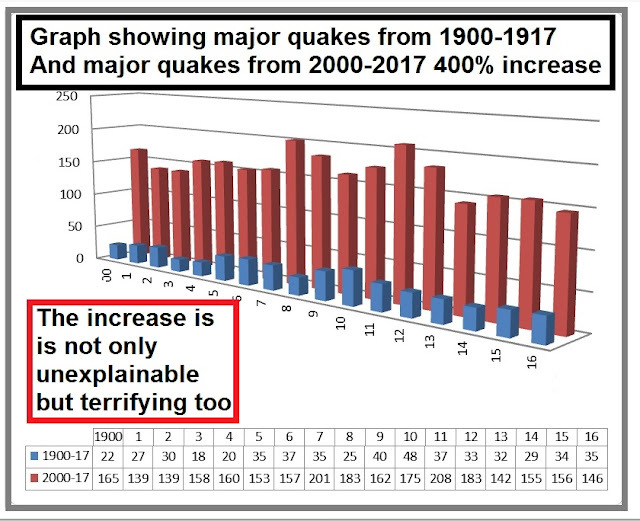 The graph was stunning and frightening; earthquakes had increased from 1900 to 2014 by an astonishing 400%. For the 3rd consecutive day, our planet is inside a stream of fast-moving solar wind flowing from a canyon-shaped Coronal hole in the sun's atmosphere. The gaseous material is pressing against Earth's magnetic field with speeds exceeding 700 km/second. In the same period, January the 1st 1900 to January 1917 only 97 major quakes were recorded, that is an incredible increase and indicates our planet is showing signs of birth pains because just as a woman in labour suffers contractions of increasing pain and intensity likewise our planet is also suffering from increasing quake pain and intensity. 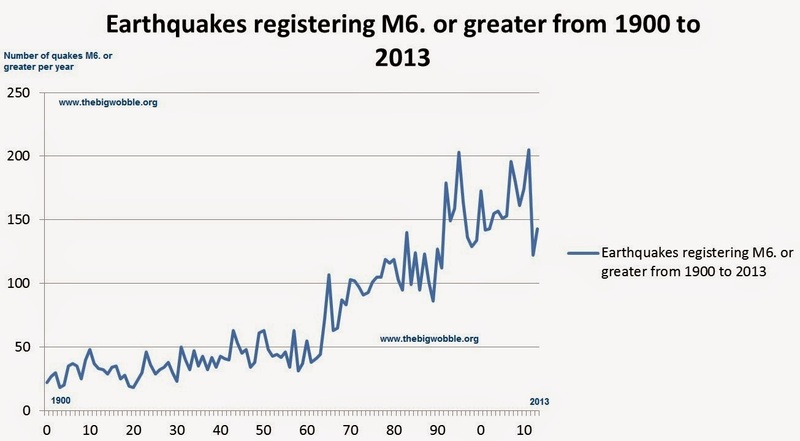 Large earthquakes have risen by over 400% since 1900 but that's, not the whole story! I accessed the earthquake information web-site USGS and downloaded every quake of a magnitude 6 or greater and fed the information into a series of graphs, the results as you can see above are outstanding! In the year 1900 our planet recorded 22 earthquakes of M6. or greater, 9 were between M6 to 6.9, 13 were between M7 to 7.9. 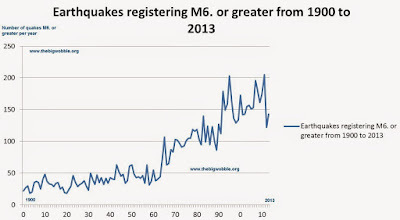 Exactly 100 years later in the year 2000 our planet recorded a staggering 173 earthquakes of M6. or greater, of which 158 were between M6 to 6.9 and 15 above M6.9. Are major earthquakes and volcano eruptions increasing in the 21st century? 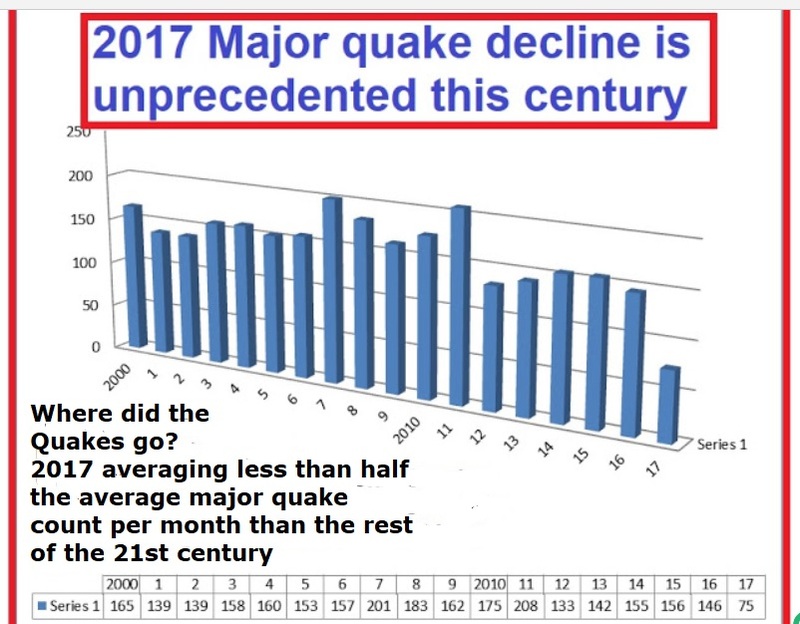 I receive many comments on The Big Wobble claiming major quakes are on the rise since the year 2000 major quakes have remained quite consistent in numbers. 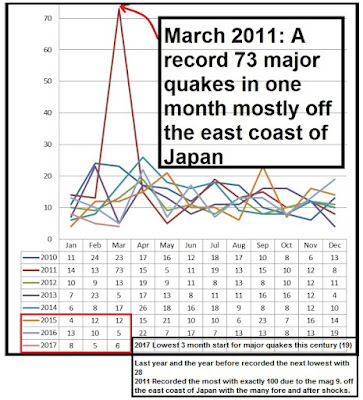 Apart from 2007 which recorded 196 major quakes and 2011 which recorded a record 207 major quakes, 81 of these being in the Japan area, the chart is remarkably similar. Major Quake Shock! The first three months of 2017 is the lowest number of major quakes this century by a mile! 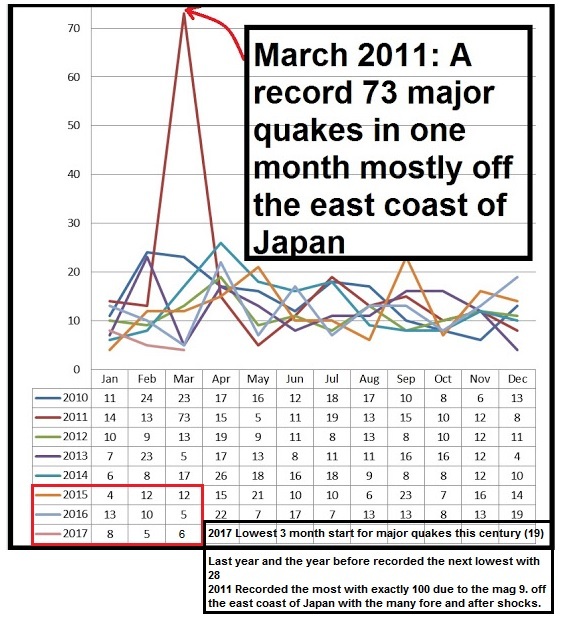 It will come as a major shock to some people but incredibly major quakes in the first three months of this year, 2017 is the lowest amount this century with a pitiful 19 major quakes recorded, only 8 on January, 5 in February and six last month in March. 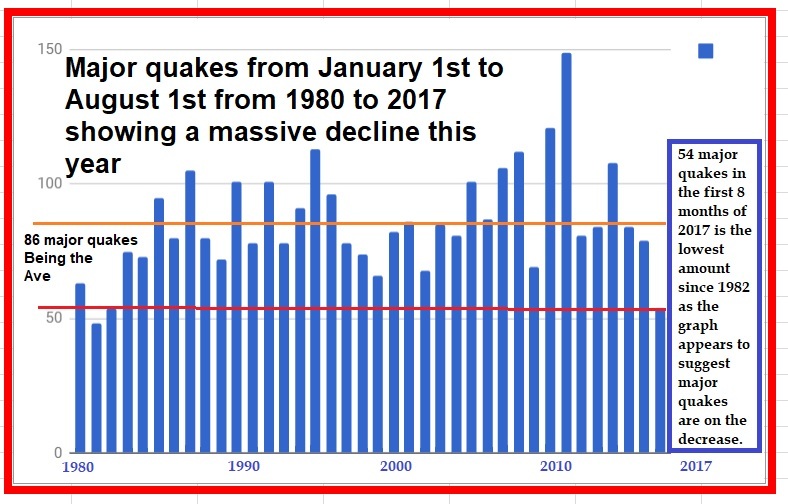 It appears to be a downward trend too because the next two lowest years was the last year 2016 and the year before 2015 both years recorded 28 major quakes in the first three months of the year. 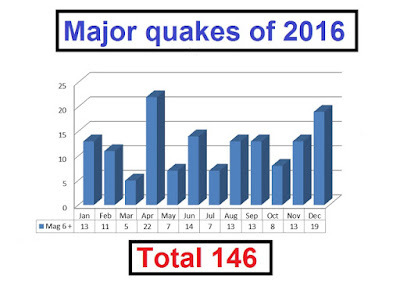 A total number of 146 major quakes was registered on our planet in the year 2016 see here below. 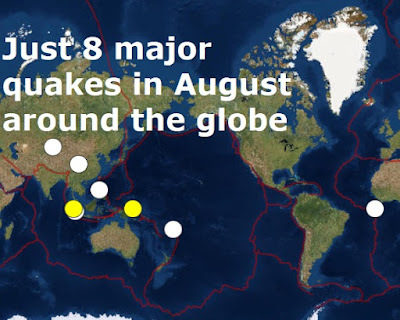 The biggest of these was the mag 7.9 - Papua New Guinea in the middle of December a week earlier a mag 7.8 hit the Solomon Isles, in November a mag 7.8 struck New Zealand, in April a mag 7.8 shook Ecuador. And in March another mag 7.8 struck Indonesia. 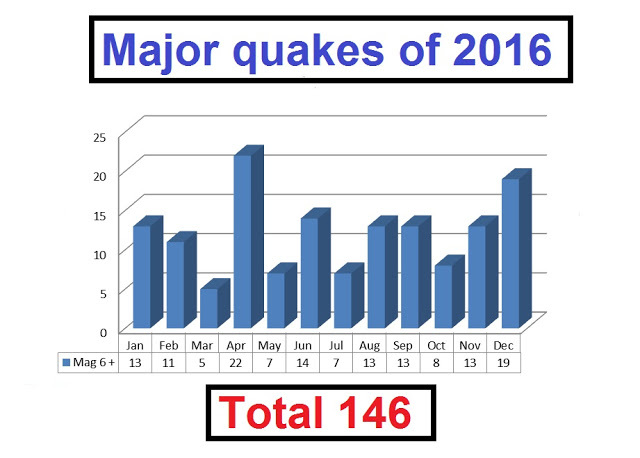 A total number of 156 mag 6 or greater was an average amount of major quakes for 2015, September has the most with a surge of 34 mag 6 +er's and January having the least with 4. The biggest quakes of the year were the 2 mag 8.3's in Chile in September. 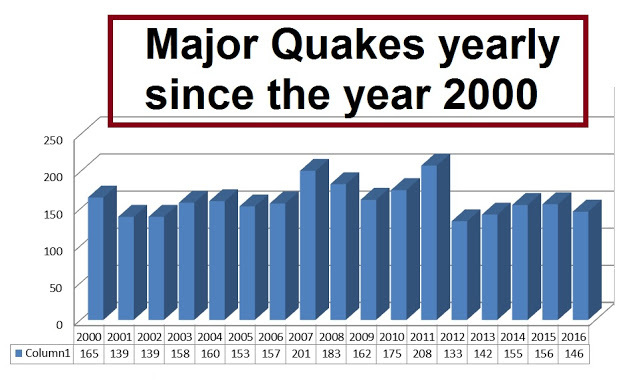 The general consensus is yes but the graph below showing major quakes since 2000 suggests differently. 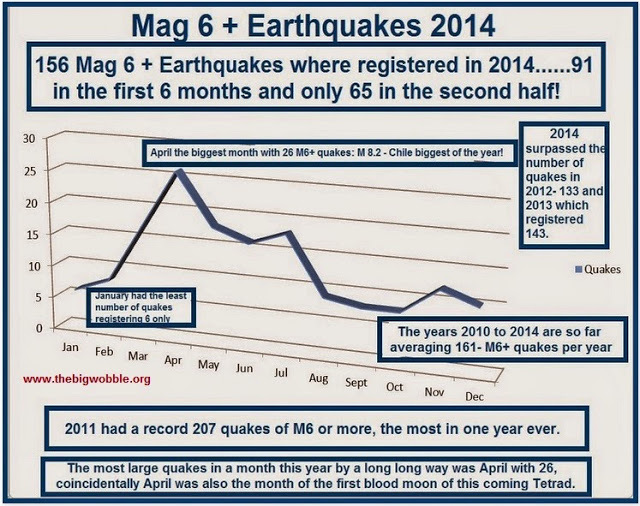 November had 12 quakes of M6 or more. October had 8 quakes of M6 or more the biggest being M7.3 WSW of Jiquilillo, Nicaragua. September had 8 quakes of M6 or more.